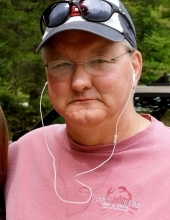 Timothy Earl Smith Belford, age 61, passed away the evening of Wednesday, June 17, 2015 surrounded by his loving family members and friends. Tim was born February 12, 1954 to Guy Ponca Belford, Jr. and Colleen Joyce (Marrs) Belford in Tulsa, Oklahoma . He graduated from Broken Arrow High School with the Class of 1972. After a successful blind date by a mutual hair stylist, he married the love of his life, Jean Rene (DeSirey) in 1978. He attended OSU and the Mortuary School Dallas… Institute. When not spending time with his family, Tim enjoyed hunting, fishing and was an avid reader of fiction, sports and read the Bible daily. His love for music brought him to participate in sound engineering for various musical groups performing in Tulsa including Tulsa’s own, The Bopcats. Tim was an avid sports fan, rarely missing a St. Louis Cardinal baseball game or an OU football game. He worked in the oilfield supply industry ending his career with Wilson Supply Company as an oilfield supply sales representative in 2009. Tim was a member of Highland Park Christian Church. He was preceded in death by parents: Guy and Colleen Belford. Tim is survived by his wife, Jean "Rene" Belford; his son, Bryan and wife, Stephanie; his daughter, Allysa Shanks and husband, Sam; his grandchildren: Rylee, Beau and Pazleigh ; his sister, Leeann Wheeler; his two brothers, Pat Belford and wife, Cindy, and Mike Belford and wife, Deborah, along with other family members, and a host of friends and acquaintances. Services are 1:00 p.m. Monday, June 22, 2015 at Highland Park Christian Church, 5708 E. 31st Street, Tulsa, Oklahoma. Pastor Dave Dunson will officiate. In lieu of flowers, the family has requested donations in Tim’s memory to www.secondwindstl.org. To send flowers or a remembrance gift to the family of Timothy Earl Smith Belford please visit our Tribute Store. Jim was a great person and friend. Me a country boy let me come into his world and friendship him and his circle of friends. I kmow he was recieved by God in the most perfect way being presented to Him by Jeasus Christ. I was so glad I went to the reunion and Tim was there. We went to Northeast Elementary together and on from there. I lost touch with a lot of people thru the years but NEVER forgot any of them. Tim always had a special place in my heart, he was a fine person and an old friend. My sincere condolences to his beloved family.